Dr. Akinwunmi Adesina is a distinguished agricultural development expert with 24 years of experience in developing and managing successful agricultural programmes across Africa. He graduated with Bachelors degree in Agricultural Economics with First Class Honours from the University of Ife, Nigeria (1981), where he was the first student to be awarded this distinction by the University. He obtained his PhD degree in Agricultural Economics in 1988 from Purdue University, USA, where he won the Outstanding PhD Thesis for his research work. Until his appointment as the Honourable Minister of Agriculture and Rural Development in 2011, he was the Vice President, Policy and Partnerships Alliance for Green Revolution in Africa (AGRA). 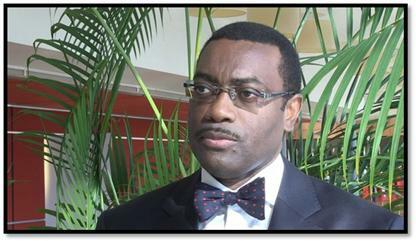 Dr. Adesina has held senior leadership positions in some of the foremost agricultural institutions in the world. He was Principal Economist and Social Science Coordinator for the International Institute for Tropical Agriculture, Ibadan (1995-1998); Principal Economist and Coordinator of the West Africa Rice Economics Task Force at the West Africa Rice Development Association (1990-1995); and Assistant Principal Economist at the International Crops Research Institute for the Semi-Arid Tropics. He was Associate Director, Food Security at the Rockefeller Foundation where he was in senior leadership positions from 1998- 2008; Regional Office Director and Representative for Southern Africa based in Harare, Zimbabwe. 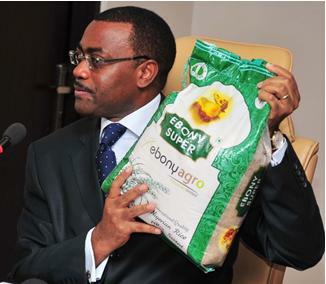 Dr. Adesina helped to design, inspire and galvanize support for the landmark Africa Fertilizer Summit. He is consultant on agricultural development issues in Africa by the World Economic Forum, World Bank and African Development Bank, among other institutions. He also the lead organizer of the Africa Fertilizer Summit for African heads of state in 2006. He was instrumental in framing the soil health policies adopted there by over 40 African governments, the African Union the New Partnership of African Development (NEPAD), and other leading global development institutions. He has published extensively and served on Editorial Boards of several leading journals. He was the President of the African Association of Agricultural Economists from 2008-2010. He has also received several international awards for his work and leadership in agriculture. In 2007, he was awarded the prestigious YARA Prize in Oslo, Norway, for his leadership in pioneering innovative approaches for improving farmers’ access to agricultural inputs in Africa. He was awarded the Borlaug CAST Award in 2010 by the Council for Agricultural Science and Technology, USA, for his global leadership in agricultural science and technology. He received the Distinguished Alumni Award from Purdue University in 2008 for his inspiring leadership in spearheading transformative changes in African agriculture. 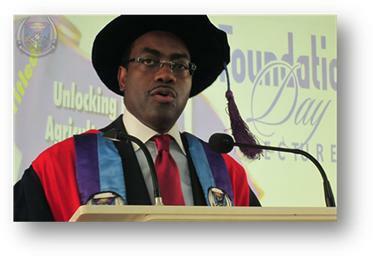 He also received the Distinguished Alumni Award from the Obafemi Awolowo University, in 2009. He was awarded Honorary Doctor of Humane Letters by Franklin and Marshall College, USA, in 2010 for his global leadership on agriculture and improving the lives and livelihoods of the poor. He won the Rockefeller Foundation Social Science Research Fellowship in 1988, which initiated his career in international agricultural development. He has worked in senior research positions in international agricultural research centres of the Consultative Group on International Agricultural Research. In 2009, Dr. Adesina was appointed into the UN Millennium Development Goals (MDGs) Advocacy Group that will drive the rapid achievement of the Goals across the globe. UN Secretary-General Ban Ki-Moon described him as an “eminent personality’’ who had shown outstanding leadership in promoting the implementation of the MDGs. Thus, he was one of the 17 global leaders to spearhead the Millennium Development Goals. With Dr Adesina came the E-Wallet scheme for the Growth Enhancement Support Scheme (GES) for fertilizers and inputs distribution in Nigeria. Today, every registered farmer can smile, as hitherto subsistence farmers can invest in agriculture as a profitable agribusiness. His one and only passion is to use agriculture to end hunger, create wealth and jobs and drive equitable economic growth in Africa to lift millions out of poverty. He has brought that passion to his native home Nigeria, in his present position as the Honourable Minister of Agriculture and Rural Development, where he is already spearheading major reforms to transform Nigerian agriculture. Indeed, looking back to where we began, we can beat our chest and say that he and his team have not failed Nigeria and Nigerians. He is married to Grace and, together, they have two children, Rotimi and Segun.